2012 Commission letters are provided as PDF files below. Download times of large PDFs will vary based on connection speed. Additional information on PDFs. Please note that Agency responses can be found in Appendix A of the Commission’s 2012 Annual Report. Recommendations and rationale to assist the Deepwater Horizon Natural Resource Damage Assessment Trustee Council in developing a restoration plan to address injuries from the oil spill, including those to marine mammals and their habitats. Permit application from the Northeast Fisheries Science Center to conduct research on pinnipeds along the U.S. east coast over five years. Permit application from the Alaska SeaLife Center to change the authorization under which non-releasable rehabilitated northern sea otters are being maintained by the facility. Recommendations regarding the draft 2012 stock assessment reports for marine mammals occurring in U.S. waters. Application from the Partnership for the Interdisciplinary Study of Coastal Oceans (PISCO) at the University of California Santa Cruz to take marine mammals by harassment incidental to rocky intertidal monitoring activities along the California and Oregon coasts. Permit application from Dan Engelhaupt, Ph.D. for authorization to conduct systematic line transect surveys for marine mammals for five years in the Atlantic and Pacific Oceans. National Marine Fisheries Service’s decision to postpone fall gillnet closures in certain New England fisheries. Request from the Navy for authorization to take marine mammals incidental to training and research, development, testing, and evaluation activities from 2014 through 2018 within the Atlantic Fleet Training and Testing study area. Request from the Navy for authorization to take marine mammals incidental to training and research, development, testing, and evaluation activities from 2014 through 2018 within the Hawaii-Southern California Training and Testing study area. Permit request from the Northeast Fisheries Science Center for authorization to conduct research on 37 specified cetacean species and unidentified Mesoplodon spp. for five years in waters of the exclusive economic zones of the United States and Canada from Florida to the Scotian Shelf. Permit request from Mystic Aquarium for authorization to collect, receive, import, and export samples from up to 5,000 cetaceans and 5,000 pinnipeds for five years for scientific research. Permit application from Georgia Aquarium Inc. for authorization to import 18 beluga whales from Russia for five years for public display. Application from Port Dolphin Energy LLC seeking regulations regarding taking of marine mammals incidental to construction and operation of an offshore liquefied natural gas facility, Port Dolphin Deepwater Port, in the Gulf of Mexico. Request for public comments on a forthcoming environmental impact statement (EIS) that will evaluate Steller sea lion protection measures for Alaska groundfish fisheries. Request from the Lamont-Doherty Earth Observatory, along with Pacific Gas and Electric Co., for authorization to take marine mammals by harassment incidental to a marine geophysical survey in the vicinity of a nuclear power plant near Morro Bay, California. Request from the Lamont-Doherty Earth Observatory, along with Pacific Gas and Electric Co., for authorization to take marine mammals by harassment incidental to a marine geophysical survey near a nuclear power plant close to Morro Bay, California. Request from the PRBO Conservation Science to renew its authorization to take marine mammals by harassment incidental to research activities on Southeast Farallon Island, Año Nuevo Island, and Point Reyes National Seashore, California from November 2012 to November 2013. Permit request from Sea World Parks and Entertainment, Inc., to import one female captive-born walrus from Kamogawa SeaWorld in Kamogawa, Japan, in March 2013 for public display. Revision to National Standard 1 Guidelines that affect the conservation and protection of marine mammals. Proposed rule to list the Hawaiian insular false killer whale population as endangered (comment period extended). Draft policy on American Indian and Alaska Native Consultation and Coordination. Application from the California Department of Transportation for authorization to take marine mammals by harassment incidental to construction activities associated with replacement of the east span of the San Francisco-Oakland Bay Bridge. Permit application from Shannon Atkinson, Ph.D., for authorization to acquire and possess samples from northern sea otters for purposes of scientific research over five years. Permit application from the Alaska Department of Fish and Game to collect, receive, import, and export samples from up to 26 species of cetaceans or pinnipeds for purposes of scientific research during a five-year period. National Marine Fisheries Services’ consideration of National Seafood Coalition proposal to modify regulation aimed at reducing takes of harbor porpoises in the Gulf of Maine. Application from ION Geophysical for authorization to take small numbers of marine mammals by harassment incidental to a seismic survey in the Alaskan Beaufort and Chukchi Seas between October and December 2012. Permit application from Robert Pilley to take by Level B harassment up to 196 bottlenose dolphins per year over five years during filming activities to document dolphin strand-feeding behavior in South Carolina and Florida. Application from the Fish and Wildlife Service for authorization to take small numbers of pinnipeds by harassment incidental to research on bird hazing methods in the Farallon National Wildlife Refuge in California. Application from the U.S. Geological Survey to renew a permit to allow it to continue research activities on polar bears in Alaska for five years. National Marine Fisheries Service’s draft environmental impact statement (DEIS) for issuing quotas to the Alaska Eskimo Whaling Commission for a subsistence hunt of bowhead whales between 2012 and 2017-2018. Permit renewal application from PRBO Conservation Science (formerly Point Reyes Bird Observatory) for research on pinnipeds along the central California coast during for five years. Application from the Gulf of the Farallones National Marine Sanctuary to take small numbers of pinnipeds by harassment incidental to black abalone research in the Farallon Islands, California. Navy’s draft environmental assessment of the effects of collecting young California sea lions for its Marine Mammal Program. Request from the Monterey Bay Aquarium for a permit amendment to conduct research on sea otters that have been rescued from the wild, are undergoing rehabilitation, and could be returned to the wild under the Aquarium’s Sea Otter and Conservation Program. Draft environmental impact statement on the Makah Tribe’s proposal to take gray whales for ceremonial and subsistence purposes. Changes to regulations in subsistence harvesting of northern fur seals on St. Paul Island, Alaska, proposed by the Pribilof Island Community of St. Paul Island and the Aleut Community of St. Paul Island-Tribal Government. Request from the Honolulu Seawater Air Conditioning, LLC, to take marine mammals by harassment incidental to construction of a seawater air conditioning project in the waters off Honolulu, Hawaii. Request from the Washington State Department of Natural Resources to take harbor seals by harassment incidental to a habitat restoration project in the Woodard Bay Natural Resource Conservation Area in Puget Sound. Permit application from John Wise, Ph.D., to import and export samples from seven marine mammal species for scientific research. Permit renewal application from the Marine Mammals Management Office for research on walruses in the Bering and Chukchi Seas over four years. Permit application from Darlene Ketten, Ph.D., to import and export samples from nine species of marine mammals for scientific research over five years. Permit application from James Shine, Ph.D. to import and receive samples from long-finned pilot whales for scientific research over five years. 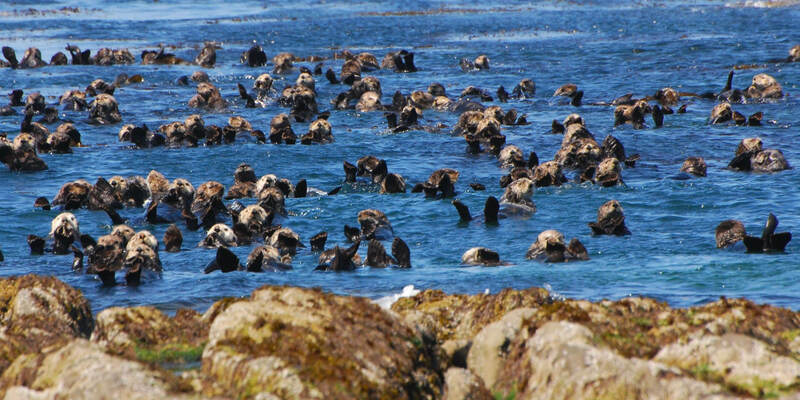 Revised stock assessment report for the southern sea otter. Proposed rule that would re-instate the special rule for polar bears. Draft environmental assessment on Commercial Wind Lease Issuance and Site Assessment Activities on the Atlantic Outer Continental Shelf Offshore Rhode Island and Massachusetts. Request from the Washington State Department of Transportation Ferries Division to take marine mammals by harassment incidental to reconstruction of the Port Townsend Ferry Terminal Transfer Span in Puget Sound. Request for permit amendment from the Southwest Fisheries Science Center to add procedures and surveys to its research on cetaceans, pinnipeds, and sea turtles in the Pacific, Southern, Arctic, and Indian Oceans. Request from Terrie Williams, Ph.D., to add the use of Evans blue dye and serial blood sampling to current permit authorizing research on non-releasable sea otters or those undergoing rehabilitation at the Monterey Bay Aquarium’s Sea Otter and Conservation Program. Permit application from Todd Robeck, DVM, Ph.D., for authorization to receive, import, and export samples from 14 species of marine mammals for scientific research during a five-year period. Application from the Air Force for authorization to take marine mammals incidental to precision strike weapon and air-to-surface gunnery missions within Eglin Air Force Base’s Gulf of Mexico Test and Training Range. Application from United Launch Alliance to renew its authorization to take marine mammals by harassment incidental to Delta Mariner operations, cargo unloading activities, and harbor maintenance activities at south Vandenberg Air Force Base, California, between September 2012 and August 2013. Draft EIS/OEIS for training and research, development, test, and evaluation activities between January 2014 and January 2019 within the Hawaii-Southern California Training and Testing study areas and their impacts on marine mammals in the central North Pacific Ocean. Draft EIS/OEIS for training and research, development, test, and evaluation activities between January 2014 and January 2019 within the Atlantic Fleet Training and Testing study areas and their impacts on marine mammals in the western North Atlantic Ocean and Gulf of Mexico. Permit amendment request from The Whale Museum to conduct research on eight cetacean species or stocks, including the southern resident killer whale, in the inland waters of Washington. Permit amendment request from the Northwest Fisheries Science Center to conduct research on 42 species or groups of marine mammals in the Pacific Ocean over a five-year period. Request from the Navy to renew and modify a letter of authorization to conduct training operations in the Mariana Islands Range Complex. Permit application from North Slope Borough for authorization to receive, import, and export samples from nine marine mammal species for purposes of scientific research during a five-year period. Permit modification request from the Alaska SeaLife Center regarding research on Weddell seals in McMurdo Sound, Antarctica. Proposed rule to delist the eastern stock (or distinct population segment) of Steller sea lions under the Endangered Species Act. Draft Programmatic Environmental Impact Statement on Geological and Geophysical Exploration of the Atlantic Outer Continental Shelf. Application from the Navy for authorization to take marine mammals by harassment incidental to pile driving and removal during wharf construction in Hood Canal at Naval Base Kitsap in Bangor, Washington. Support for announced closing of New England fishing area to reduce bycatch of Gulf of Maine harbor porpoise in commercial gillnets. Permit application from the America’s Cup Event Authority and the Port of San Francisco for authorization to take marine mammals by harassment incidental to construction, helicopter overflights, and firework displays to support the 34th America’s Cup in San Francisco. Request from Geo-Marine, Inc., to amend a current permit by increasing the number of sei whale takes each year to gain more information on their distribution and habitat use. Permit application from Robert Garrott, Ph.D., for authorization to conduct research on Weddell seals at Cape Evans, Backdoor Bay, Hut Point, Cape Royds, Terra Nova Bay, and northwest White Island, Antarctica. Application from the Navy for authorization to take marine mammals by harassment incidental to pile removal during wharf repair at Kitsap Naval Base in Bangor, Washington. Confidentiality of observer information collected under the Magnuson-Stevens Fishery Conservation and Management Reauthorization Act. Listing of the polar bear, walrus, and narwhal on CITES Appendices. Permit application from Bruce Mate, Ph.D., for authorization to conduct research on cetaceans and pinnipeds in U.S., foreign, and international waters. Amendments to the Fishery Management Plan for the Groundfish of the Bering Sea and Aleutian Islands Management Area, and for the Groundfish of the Gulf of Alaska. Permit application from Stephen Trumble, Ph.D., for authorization to obtain and conduct analyses on mysticete earplugs during a five-year period. Permit application from Robert Garrott, Ph.D., for authorization to conduct research on Weddell seals in Antarctica during a five-year period. Permit application from Shannon Atkinson, Ph.D., for authorization to receive, import, and export samples from unidentified cetaceans and pinnipeds for purposes of scientific research and education during a five-year period. Permit application from Mark Baumgartner, Ph.D., for authorization to study eight mysticete species in the northwest Atlantic, northeast Pacific, and Arctic Oceans during a five-year period. Letter in support of the Sound and Marine Life Joint Industry Programme. Request from the Alaska Department of Fish and Game to amend its current permit to conduct research on Steller sea lions throughout their range in Alaska. Request from James Hain, Ph.D., to extend a current permit authorizing aerial and vessel surveys of humpback and North Atlantic right whales off the U.S. southeast coast during a five-year period. Request from Alaska SeaLife Center for amendments to a current permit authorizing research on Weddell seals in Antarctica. Draft environmental assessment on Lease Issuance for Marine Hydrokinetic Testing Technology on the Outer Continental Shelf Offshore Florida. Permit application from Eye of the Whale for authorization to conduct research on humpback whales in Alaskan waters during a five-year period. Request on behalf of the Columbia River Crossing project, for authorization to take pinnipeds incidental to construction and demolition activities in the Columbia River and North Portland Harbor, Washington and Oregon. Application from Lamont- Doherty Earth Observatory for authorization to take marine mammals by harassment incidental to three marine geophysical surveys in the Northeast Pacific Ocean from June through July 2012. Permit application from John Calambokidis for authorization to conduct research on cetaceans and pinnipeds in the eastern North Pacific Ocean during a five-year period. Permit request from the Pacific Whale Foundation to change its principal investigator in its application to study humpback whales in Hawaii during a five- year period. Permit application from Milton Levin, Ph.D., for authorization to conduct analyses on manatee and polar bear samples during a five-year period. Permit amendment request from the Alaska Department of Fish and Game to add procedures to its permit to conduct research on walruses throughout their range in Alaska. Permit renewal request from Edmund Gerstein, Ph.D., for authorization to take Florida manatees by deliberate harassment to test the effectiveness of an acoustic device for alerting them of approaching vehicles. Status review of the ringed seal under the Endangered Species Act. Status review of the bearded seal under the Endangered Species Act. Proposed Cook Inlet Special Interest Lease Sale 244. Proposed rule to amend the Bottlenose Dolphin Take Reduction Plan. Request from the Navy for authorization to take marine mammals incidental to military training operations at the Silver Strand Training Complex in San Diego, California. Request from the Saint Louis Zoo for authorization to import four female captive harbor seals from Storybrook Gardens in London, Ontario, Canada. Permit application from Colleen Reichmuth, Ph.D., for authorization to capture from the wild and maintain in captivity two bearded seals for the purpose of scientific research. Whether the Service should extend or modify the final rule to implement vessel speed restrictions to reduce the threat of vessel collisions with North Atlantic right whales. Application from AMEC Environment & Infrastructure, on behalf of Fishermen’s Atlantic City Windfarm, for authorization to take marine mammals by harassment incidental to the installation of wind turbines off the New Jersey coast. Permit amendment request from the Alaska Department of Fish and Game to add procedures to a current permit authorizing research on harbor seals through their range in Alaska. Permit application by Simon Nash for authorization to take up to 1,300 spinner dolphins per year during filming near Midway Atoll in the Pacific Ocean over five years. Application from the Monterey Bay National Marine Sanctuary for authorization to take marine mammals incidental to firework displays between 4 July 2012 and 3 July 2017. Application from Lamont- Doherty Earth Observatory to take marine mammals by harassment incidental to a marine geophysical survey in the central Pacific Ocean in May and June 2012. Application from the Virginia Institute of Marine Science for authorization to import samples from four phocid species for scientific research. Status of exploration and drilling activities in the Arctic and actions that are being or will be taken to prevent, contain, and respond to an oil spill. Draft revisions to the Guidelines for Assessing Marine Mammal Stocks. Application from the Scripps Institution of Oceanography for authorization to take marine mammals by harassment incidental to a marine geophysical survey to be conducted in the southeastern Pacific Ocean in May 2012.
Review of the Bureau of Ocean Energy Management final environmental assessment on Commercial Wind Lease Issuance and Site Assessment Activities on the Atlantic Outer Continental Shelf, and repeated recommendations from the Commission. Application from Sonoma County Water Agency to renew its authorization to take marine mammals by harassment incidental to construction and maintenance activities associated with estuary management at the Russian River near Jenner, California. Permit application from Mote Marine Laboratory for authorization to collect, conduct analyses on, and archive manatee blood samples during a five-year period. Application from the Navy for authorization to take marine mammals by harassment incidental to testing the AN/AQS-20A Mine Reconnaissance Sonar System (Q-20) in the Gulf of Mexico during a one-year period. Application from The Whale Museum to amend a permit that authorized monitoring of vessel activities in the state of Washington, by changing its principal investigator. Application from Glenn VanBlaricom, Ph.D., for an incidental harassment authorization to take seals and sea lions incidental to abalone research on San Nicolas Island, California. Permit application from Jooke Robbins, Ph.D., for authorization to conduct research on cetaceans in the Gulf of Maine, Atlantic Ocean, Gulf of Mexico, and Caribbean Sea during a five-year period. Commission comments on the National Ocean Council’s draft National Ocean Policy Implementation Plan. Application from James Harvey, Ph.D., to renew his permit to conduct research on harbor seals along the U.S. west coast during a five-year period. Request from Robin Baird, Ph.D., for authorization to conduct research on 27 specified cetacean species and unidentified Mesoplodon spp. in all U.S. and international waters in the western Atlantic Ocean during a five-year period. Commission comments on the draft policy interpreting the phrase “significant portion of its range” as used in the Endangered Species Act. Commission comments on the draft National Fish, Wildlife, and Plants Climate Adaptation Strategy. Commission comments on the draft environmental impact statement on effects of oil and gas activities in the Arctic Ocean. Application from the Lamont- Doherty Earth Observatory for authorization to take marine mammals by harassment incidental to a marine geophysical survey in the northwest Pacific Ocean from March through May 2012. The Commission expressed its desire to facilitate cooperation among agencies and thereby improve response to wildlife health and disease events. Application from Ocean Renewable Power Company Maine, LLC, for authorization to take marine mammals by harassment associated with the installation of a tidal energy turbine in Cobscook Bay, Maine. Draft environmental impact statement for proposed 2012-2017 oil and gas lease sales in the Gulf of Mexico Western and Central Planning Areas. Permit application from Matson’s Laboratory for authorization to import, export, and analyze pinniped teeth during a five-year period. Permit application from Dorian Houser, Ph.D. for authorization to conduct research on hearing sensitivities of cetaceans in the United States during a five-year period. Permit application from NHK Enterprises for authorization to take up to 300 killer whales up to three times and 100 gray whales up to two times during filming of the hunting behavior of transient killer whales for TV, internet, DVD and other media. Permit application from Shane Moore for authorization to take 35 killer whales and 10 gray whales during filming for a National Geographic Channel program. Application from the Navy seeking authorization to take marine mammals incidental to training, testing, and routine military operations using the Navy’s Surveillance Towed Array Sensor System Low Frequency Active (SURTASS LFA) sonar source. Permit application from Alejandro Acevedo-Gutierrez, Ph.D., for authorization to conduct research on harbor seals in Washington waters during a five-year period. Permit application from Gregory Walker, University of Alaska Fairbanks, for authorization to conduct unmanned aerial surveys of Steller sea lion terrestrial habitat from Kodiak Island to Attu Island, Alaska. Permit application from Kenneth Balcomb, The Center for Whale Research for authorization to conduct research on cetaceans, primarily killer whales, in the eastern North Pacific over a five-year period. Permit application from the Pacific Islands Fisheries Science Center to conduct research on 26 specified cetacean species. Corrections to 7 and 14 December letters pertaining to authorizations for taking marine mammals incidental to training operations in the Virginia Capes, Cherry Point and Jacksonville Range Complexes, as well as the Hawaii Range Complex. Permit application from the St. George Reef Lighthouse Preservation Society for authorization to take pinnipeds by harassment incidental to restoration and maintenance on Northwest Seal Rock light station off the coast of Crescent City, California.